Gabapple, furry artist and creator of the webcomic Dangerous Cute, was the first 2013 GoH to be announced. ConFuzzled 2013 will take place Thursday 30 May–Monday 3 June in Hinckley, Leicestershire. Popular European conventions Eurofurence and ConFuzzled have announced their intent to form a combined body: EuroFuzzled. Running a convention involves a lot of logistics and expertise, as well as time and commitment. In order to reduce costs and overlap, it is in the interests of both conventions to pool resources together. The UK and DE editions of EuroFuzzled will still be lead by Matt Lion and Cheetah respectively; however, art show panels, registration systems, badge printers, regualar guests, hired entertainers and gophers will be shared between the conventions. The news goes some way towards explaining the recent notice of ConFuzzled's cancellation. Update: A new announcement from ConFuzzled suggests the merger will not go ahead. UK furry convention ConFuzzled 2010 went out in style this weekend, raising £6,200 for the Wildlife Heritage Foundation. 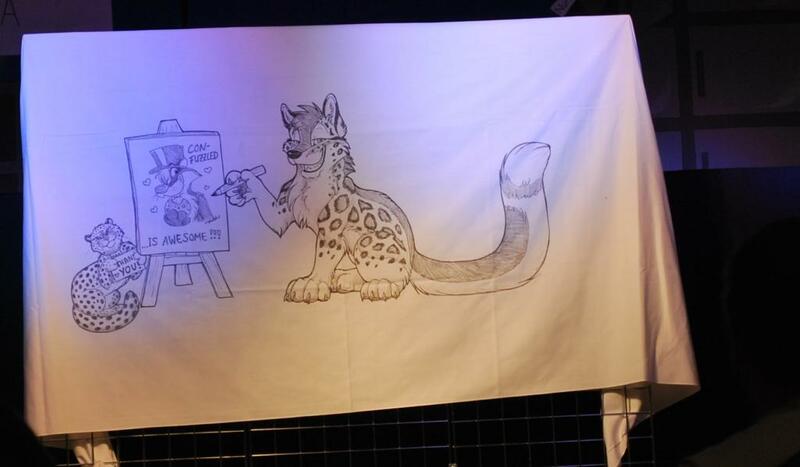 The final auction item was a piece of tablecloth art by guest of honour TaniDaReal. Starting at £50, the price rose swiftly, fueled by a bidding war between ConFuzzled staff member Colifox and U.S. fur Beshon, ending only with the latter's bid of £2,000 (US$2,962). In 2008, the British furry convention ConFuzzled raised £1,600 for charity. In 2009, ConFuzzled raised £2,000 for charity. Today – less than an hour ago – ConFuzzled smashed that record with only one item. The item, a tablecloth with artwork by guest of honour TaniDaReal had a starting bid of £50, which quickly exploded into the hundreds and then the thousands. In a bidding war that lasted several minutes between staff member Colifox and American furry fan Beshon, the bids finally jumped from £1,800 to £2,000 and ConFuzzled history was made for the largest bid paid for any item in an auction. ConFuzzled 2009, the second rendition of the Manchester-based British furry convention, has now sold out! ConFuzzled - the first fully-residential furry convention in the UK - was initially deemed "the convention that wouldn't happen", due to scepticism over the viability and interest in a convention; this was condemned along with previous failures at starting a British event. However ConFuzzled turned out to be a runaway success, and that seems to have come this year too, with all places selling out five months earlier than in 2008, despite the addition of numerous "attending only" tickets (the lack of which was a large criticism of ConFuzzled 2008). A waiting list is now in action, so if you're still iffy on attending then now's the time to make your decision. Whether we here at FT cover ConFuzzled again as we did last year remains to be seen, but let's hope we do! Residential registration has already opened and nearly sold out, with only 37 “attending only” placements left at time of writing. Compare this to last year, when the last tickets were sold only weeks before the start of the convention. And all these sold before the events schedule is even announced. The 2009 schedule is much the same as last year, with an opening day barbecue and the new “WikiFur PubQuiz”. One notable change is the Guest of Honour slot, this year occupied by Tabbiefox, and his cartooning workshop. The Furrylimpics is still a large part of the weekend line-up. Timduru’s FursuitTV makes a return too, followed on by QI parody quiz “Furry Interesting”. One more guest of honour is due to be announced, be sure to get your place if you haven’t already! Thanks to all the folks who put their ConFuzzled videos, as well as the ConFuzzled staff themselves! Thanks to all the folks who put their ConFuzzled photos online, as well as the ConFuzzled staff themselves! ConFuzzled! Photo by Tiger Tom. Reported by Ash Paluk - now known in the furry community as Zaishi Mai. Saturday the 21st of June marked a significant day for Northern furries, the first UK convention outside of London, ConFuzzled. Of course, I had to wake up late. After a power-shower and a quick breakfast, I arrived in Manchester, meeting with Tori and Silentwulf, among others including Hyss and Istauri. I must say, I've never met quite a more friendly bunch of people, and this being my first meeting with a group from the fandom, ensured that my positive view on furries continued. Recent news from conventions near and far. ConFuzzled organizers were celebrating last night, as the newly-minted UK convention sold its last ten spaces. The event is scheduled for June 20-23 at the Manchester International Youth Hostel, which holds 144 attendees, including 16 staff and 47 sponsors. Most were charged £170 [US$340] (£210 for sponsors), £135 of which covered YHA costs, though the price was £10 lower for the first eight weeks. Demand was even higher for rooms at late August's Eurofurence 14, which opened registration this Sunday. Badge numbers over 600 were issued in the first 3 hours of registration, and a total of 760 had registered to pay by Wednesday morning. Manchester-based furry convention ConFuzzled has selected a guest of honour: German artist, DJ, photographer and fursuiter BigBlueFox, known worldwide for his DJ sets and convention videos, and locally for his live DJ'ing at Eurofurence and Mephit Mini Con. ConFuzzled will be his 26th convention. Additional events were also announced, including an instructional panel on filming furries, and a pub quiz based on facts from WikiFur. ConFuzzled is to be held June 20-23 2008, at the Manchester Youth Hostel in North West England. A maximum attendance of 144 is planned. As of December 5, over 40% of those registering had indicated that they were fursuiters. After our recent staff meeting, we're pleased to confirm that we've now updated all of the ConFuzzled events!